Green building, as promoted by the various rating systems employed to quantify a project’s adoption of its principles, is now fully entrenched in the way we design, supply, and construct buildings and sites. And that’s a good thing. The emphasis on reducing greenhouse gas emissions and improving the impacts of a building on the health and performance of occupants has aided the paradigm shift in how these are valued. Complementary to, and in concert with, green building quantifications is the growing move toward resilient design. The American Institute of Architects (Understanding Resilience), describes a resilient environment as that which "can more successfully adapt to natural conditions and that can more readily absorb and recover from adverse events." The discussions have been about the ability of the built environment to survive disasters in the first place and to continue to provide shelter in the aftermath. No matter where we build, something lurks as a potential natural catastrophic event – underfoot, overhead, or over the horizon. Unfortunately, we must also take into account the effects of man-made events, whether by accident or by intent. And that ability to survive must be designed in. Resilient design is dependent upon resilient materials and systems, those that are durable, strong, stable, and inert; systems that are multi-functioning, providing multiple attributes that can be employed by designers to perform roles with minimal materials. Concrete masonry is such a system. At the heart of resilience are people and protection of their lives, safety, and shelter, both during and after a disaster event. Reinforced concrete masonry has a long history of performance in seismic, fire, and storm events, withstanding extreme forces and remaining stable. The thermal properties of concrete masonry’s mass are proven to support successful passive solar designs, and thus could help provide livable indoor temperatures during a power outage. Mass walls transmit heat and cold slowly, and interior exposed masonry lessens temperature swings. Extensive research and full-scale, shake table testing of concrete masonry, notably at the UC San Diego Englekirk Structural Engineering Center, has advanced the understanding and informed the design of the system for seismic resistance. These studies have led to updated, more efficient masonry building codes, furthering the safety and reliability of a system that already had a successful history of seismic performance. There are many examples of reinforced concrete masonry buildings with minor to no damage in the vicinity of other building types heavily damaged or completely collapsed by an earthquake. 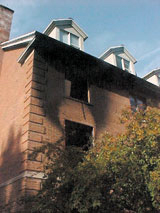 However a structure fire may begin, triggered by a disaster, accident, or arson, the lives of occupants depend on how the materials from which the building is constructed respond to heat, flame, and fire-fighting methods. Concrete masonry simply does not burn. It is completely inert, and does not release any toxins when exposed to heat. Nor will it fail when hit with powerful water streams from fire hoses. Other composite, layered systems with paper or fiber based materials suffer breakdowns from many factors – flammability, toxic components, and disintegration from water. A balanced design approach is critical and considers containment, detection, and suppression. Without containment, however, the other two components may not matter, and real-life examples of multi-residential structures have shown concrete masonry and precast concrete flooring are cost-effective means of preventing rapid, catastrophic spread of fire. Designing for containment limits damage to the space in which the fire began, allows time for detection and suppression to be effective, and results in relatively minor restoration costs vs. complete structure loss and rebuild. Occupancy and use of a building may indicate consideration of designing for blast resistance. From a design and psychological perspective, however, no one wants the look and feel of a bunker. Concrete masonry is as much a versatile design material as it is the utilitarian mass wall that protects so well against natural disasters. As such, it can offer aesthetic freedom while its structural design can be modified to meet the intended safety criteria. It must be noted that broad statements about the brittleness of masonry and tendency to generate hazardous flying debris are remarks directed at unreinforced masonry. 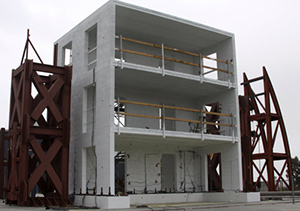 Recent tests by the Air Force Research Laboratory on fully grouted and reinforced 8-inch walls demonstrated excellent ductility under blast loading (NCMA TEK 14-21A). Solid grouted concrete masonry walls have been shown to prevent through-wall penetration of bullets fired from high-powered rifles and automatic weapons. The attributes of reinforced solid grouted concrete masonry that resist seismic and wind forces also make the system resistant to flood damage. Concrete masonry will not degrade with exposure to flood waters, and does not provide a food source for mold growth. FEMA lists solid grouted concrete block as a Class 5 (highly resistant) building material. Reinforced concrete masonry is very capable at withstanding high winds. It’s relatively large mass, connections to footings and diaphragms, and inherent strength resist the uplift and overturning forces generated by high wind speeds. Tests have also demonstrated excellent resistance to impacts of wind-borne objects. 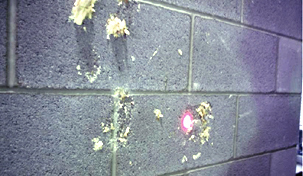 Projectiles that penetrate stud-based walls are stopped by solid grouted concrete masonry walls. Desert Block Co., Inc. supplies this information as an educational aid in understanding the benefits of concrete masonry construction and our products. It is the responsibility of the user to obtain engineering or other advisory services from licensed professionals as the basis for incorporating into any project any information, detail, or product offered herein.